On this page we give in-depth information as well as our best tips and advice for working with the Tumbling Machine for Polishing Stones & Glass. We feature the most frequently asked question we are asked from customers when considering the tumbling machines as well as a few more we think are useful to know! 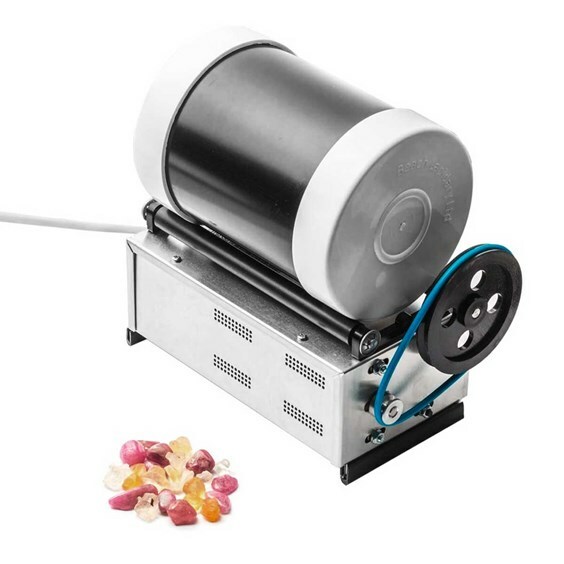 The tumbling machine is a really popular product and a great investment if you are an avid beach comber or you simply love the magic of lapidary. If there is anything you would like to know that has not been covered on this page, please feel free to get in touch. A PDF copy of the full instruction leaflet can be found for you to download at the bottom of the page. What is a Tumbling Machine For Polishing Stones & Glass and How Does it Work? Tumble polishers (also known as rock tumblers, lapidary tumblers and rotary tumblers) polish your glass, pebbles, rocks, shells or gems to a matt or gloss finish. They work by `tumbling` the grit particles around in the spinning barrel which repeatedly fall onto the material being polished and the tiny scratches gradually polish the surface. Do I need to buy anything else before I can use my tumbler? 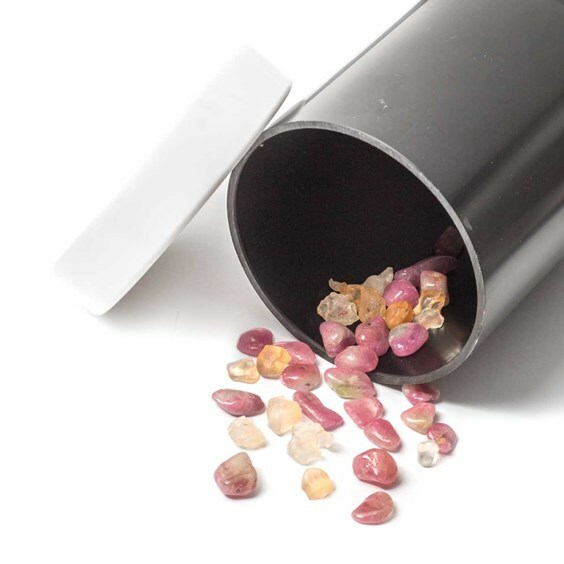 Our tumbler comes with everything you need to start tumbling stones – all you need to get is some stones or glass to tumble! 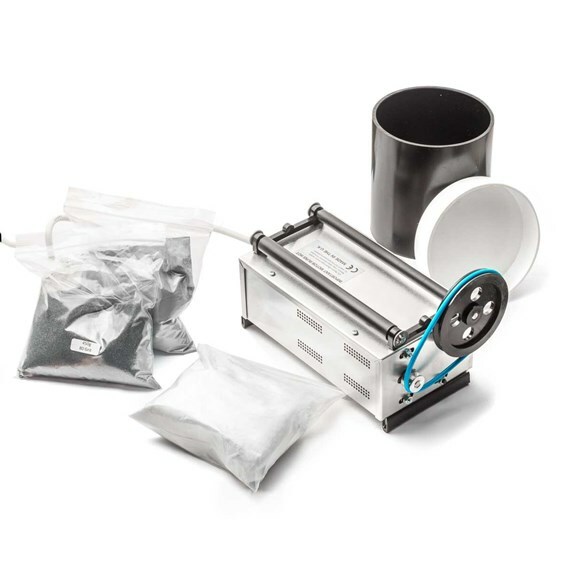 This tumbler comes with an electric motor base, 2 grades of grit, polish and a 3lb plastic barrel. What is grit and what are the different grades? the tiny scratches gradually polish the surface. The grit we sell is silicon carbide which is a hard, sharp, angular material which gradually fractures into smaller angular particles, making it an effective abrasive. You work your way up through the grit grades (like sandpaper and polishing papers) starting with coarse - 80 grade to fine - 400 grade. Each grit should be handled carefully to ensure you don’t get any stray particles from one grade mixed in with another as this could cause scratches when you are trying to smooth the surfaces with tumbling. How do I know which grit to use? With a bit of practise you’ll soon learn which grit to use and for how long. It should be noted that when you are tumbling a number of items at one time, you should choose stones or glass of a similar size and hardness. What is the polish used for? The polish is a very fine zinc oxide paste which is used as the final stage of tumbling glass and stones to bring your work to a gloss finish. It is worth remembering that polishing is the final step in the tumbling process, it won’t remove any scratches left from previous stages of tumbling. How many stones can you tumble at once and what’s the largest stone I can tumble? You can fit roughly 20 large-ish stones in the barrel - but it really does depend on the size of the stones. The more tumbling you do the better you will be able to gauge how many stones to put in at once. The largest stone you should polish is about 4cm in diameter. How long do I need to tumble items for? It depends on the finish you’re after, this is something you will pick up over time. Most stones will need tumbling over a period of days - you can always stop and check on your work and put it back in if it requires more tumbling. How shiny will my stones be after tumbling? Again, it depends how long you’ve been tumbling them for, but you can obtain a nice glossy finish if you work through all the grits and the polish thoroughly. Can I use the same barrel for steel shot (for metal) and grits (for tumble polishing stones)? We highly recommend using separate barrels for shot and grits. If you are using the same barrel for both it is imperative that every single grain for grit is removed before using again for shot (this is virtually impossible). If one single piece of grit is left in the barrel it will scratch the work you’re trying to polish and chances are you would never be able to find it amongst the shot. It’s a risk best avoided! Would this tumbler be suitable for heavy use (for example for classes)? Absolutely, as stones and glass sometimes need days this tumbler is designed for heavy use. How do I open and close the barrel? The end caps do not screw on but are a snug fit to avoid leakage, they can be eased on and off by simply soaking them in hot water for approximately 2 mins. What if I need a replacement part after I’ve had it for a long time? the tumblers that we sell here at Kernowcraft come with a 5 year motor guarantee! In the unlikely event of an accident or a fault with your barreling machine motor or if you need to replace any another part of your machine (at a cost) please contact us. We can put you on to the UK distributor who will be able to supply you with the new part and, if necessary, talk you through the replacement process on the phone. I don’t have a workshop – could I use it in my house? Absolutely – the tumbler is fitted with a UK plug and can be plugged into a regular mains socket. The machine has a 1.8m cable, is CE marked and complies with EU safety standards. It has rubber feet to help stop it scratching your work surface and to stop it creeping across and falling off and as it’s a fairly compact size it can easily be stored in a cupboard when not in use. Do I need to clean the tumbler and if so, how do I do it? You shouldn’t need to clean the tumbler but if you do then you can use washing up liquid and make sure you rinse it thoroughly afterwards. Do I need any safety equipment? Safety equipment is not really needed when working with the tumbling machine, however you must make sure any loose clothing, jewellery or hair is tied back out of the way so they don’t get caught around the roller. As with all electrical equipment, don't get the motor part of your tumbler wet and don't touch it with wet hands. The motor is a low-speed, long-life design which won’t overheat if you leave it unattended. Always unplug it when not in use or when it’s being serviced. It has plastic feet to prevent it from scratching your work surface and to stop it creeping across and falling off. Unlike some tumblers, the motor is under the drum rather than at the end - this is so the tumbler takes up less space. If you would like to read more information about polishing stones or glass with a barreling machine you can download the PDF instruction leaflet here.